From doctors to teachers. Against children’s rights protection law changes and for the impeachment of a member of Seimas. The lrt.lt news portal presents protests held in 2018, which drew crowds and caused ripples throughout the public. During the first days of 2018, resident doctors organised a protest, seeking better wages. Bearing suitcases, they first arrived at Vilnius Airport because most of young doctors emigrate. From the airport, they headed to Cathedral Square and met minister Aurelijus Veryga there. Meanwhile, Prime Minister Saulius Skvernelis described the protest as political. This was not the only doctors' protest in 2018. In late April, on the eve of Doctors' Day, they gathered by the Seimas. Armed with placards, the doctors gathered in the Independence Square near parliament and sought to remind the government of the promises it gave and spoke of how both doctors and patients feel. The doctors demanded that all healthcare financing would be prioritised and would reach 10% of the country's GDP over the next three years. It was demanded that the public procurement sector would be adjusted and corruption removed. At the time, the government agreed that from May 1, doctors' wages would rise an average of 20%. The cabinet also committed to raising doctors' average wages to 3 average monthly wages 2020 and nurses' to 1.5 of the average monthly wage by 2020. That said, already prior to the doctors' protest, Minister of Healthcare Aurelijus Veryga expressed surprise that some of the doctors' questions were posed even after having been answered. 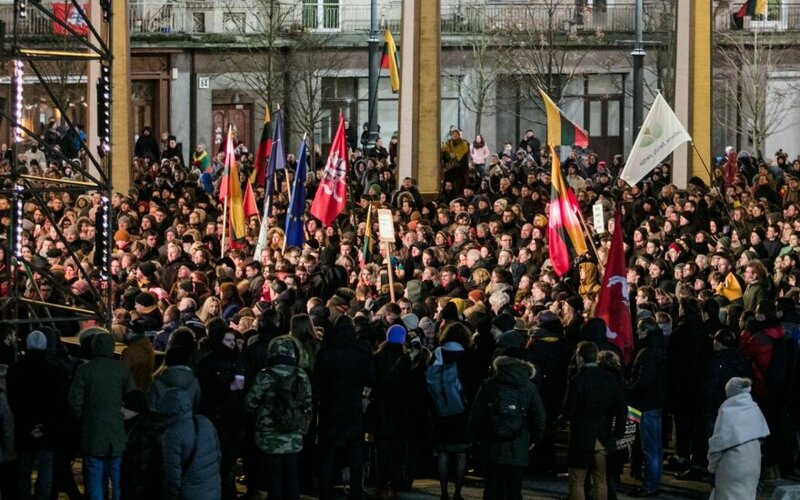 Perhaps one of the largest protests in 2018 occurred in March after the failed impeachment of member of Seimas Mindaugas Bastys. Massive public discontent arose after the Constitutional Court ruled that M. Bastys broke his oath and was in breach of the Constitution, an impeachment was organised against the MP, but failed. He managed to hold on to his seat in parliament after secret ballots in Seimas. That said, the politician soon voluntarily resigned from parliament. At the time, Laisvės TV [Freedom TV], which is led by journalist Andrius Tapinas, organised the We Accuse! [Mes Kaltinam!] Protest, which was met with much public interest. A crowd of thousands participated in the protest next to the Seimas, demanding more transparency in the Seimas' work, changes to its regulations so that votes like the one regarding M. Bastys would be transparent. Among the demands was also to impose stricter regulations for members of Seimas, who do not attend sittings, make it more difficult for MPs to change Seimas groups and also to initiate impeachment proceedings against MP Artūras Skardžius. The crowd, gathered in Independence Square, shouted "shame" when Seimas Speaker Viktoras Pranckietis took to the stage. To many people's surprise, the speaker himself responded that he was ashamed of the Seimas, the situations regarding M. Bastys, Kęstutis Pūkas, A. Skardžius and so on. Finally, accompanied by shouts of discontent, V. Pranckietis himself urged the crowd to chant "shame". In response to the speaker's words, "Farmer" leader Ramūnas Karbauskis retorted that if the Seimas speaker is ashamed, he can resign. The idea of snap elections was also brought up, but was not discussed in parliament. On July 1, the new children's rights protection reform came into power in Lithuania. While iniatially there as little uproar over it, soon news flew across Lithuania that apparently a smack on the hand for a child resulted in two children, aged two and three, being taken from a family in Kaunas. Upon agreeing with the Children's Rights Protection Service's requirements, the children were returned to the family. In late October, a protest was organised next to Seimas, where those gathered demanded to change the children's rights protection law or even withdraw it, also for the MPs, who initiated the law and Minister of Social Security and Labour Linas Kukuraitis to leave their posts. Another protest was held after almost a month, on November 25. In it, impeachment was demanded for member of Seimas Dovilė Šakalienė and the withdrawal of the children's rights protection law. According to the participants of the protest, this law is harmful to children, destroys families and is responsible for the illegal taking of children and so on. On that day, a crowd also gathered next to Seimas, mostly parents with small children. The protest also featured Kaunas resident Eglė Kručinskienė, whose children were taken. After the protests, "Farmer" Mindaugas Puidokas and 57 members of Seimas presented proposals, which according to them would establish further safeguards in the children's rights protection system. Perhaps the most attention among the protests this year was drawn by the teachers' trade union strike, which caused much uproar in the public. In mid-November, the Lithuanian Education Staff Trade Union (LŠDPS), led by Andrius Navickas, declared a strike regarding the new teachers' wage payment model. The educators demanded not only changes to the wage payment system, but also to raise teachers' wages by 20% by the start of 2019. The teachers' strike launched on November 12 and soon gained momentum, with several tens of teachers staging a sit in at the Vilnius-based Ministry of Education and Science on November 28. The teachers belonging to the LŠDPS stated they would not leave the ministry until negotiations on their demands would begin. On November 30, teachers returning from a protest were barred from entering the ministry, thus instead they climbed in through its windows. A number of support events were held for the teachers, with teachers, students and other supporters protesting. With the start of the protests, the then Minister of Education and Science Jurgita Petrauskienė stated that the teachers are being manipulated and lies being disseminated. "There is much manipulation with false news, much inciting. When we travel around schools, we see that the municipal elections are nearing, that teachers are manipulated, being convinced to go on strike," J. Petrauskienė said on Žinių Radijas. A coordination group assembled by the Ministry of Education and Science visited various schools around the country and spoke to teachers. However, this did not end the strikes and the number of striking institutions rose. Furthermore, Prime Minister Saulius Skvernelis stated he sees no basis for teachers to be on strike because apparently with the new model, the average teacher wage rose. Nevertheless, the trade union organising the strike did not stand down and stated that the strike will only end when agreement is reached. The sit-in was visited by politicians, party leaders, public figures. A number of protests were organised – both by students, teachers, as well as supporters. The striking teachers were discontent they were not listened to, spoken to and their demands not considered. At the time, the Ministry of Education and Science calculated that to implement the teachers' demands, 300 million euro would be needed. On December 3, PM Saulius Skvernelis declared he is dismissing J. Petrauskienė from her position. WIth Minister of Transport and Communications Rokas Masiulis becoming interim head of the Ministry of Education and Science, negotiations with the teachers were extended. 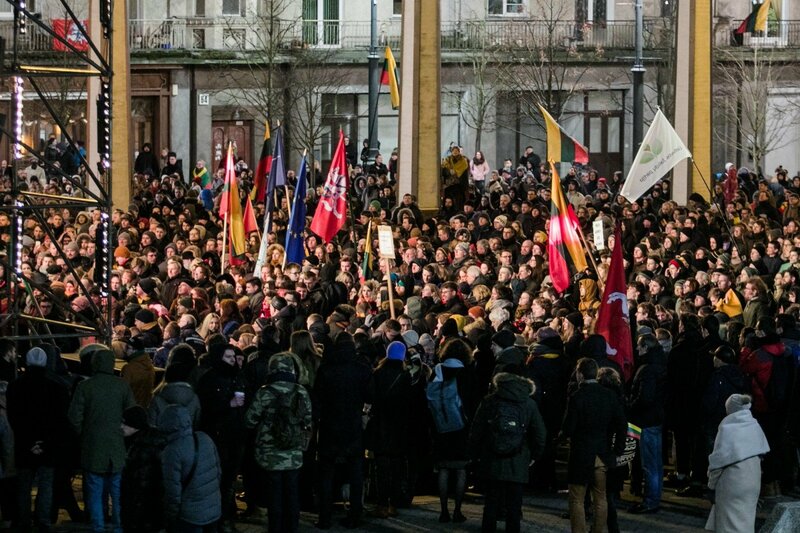 On December 9, a mass protest Paskutinis Skambutis [Final Bell] was organised, during which a chain of people formed from the Ministry of Education and Science through Gediminas Avenue all the way to the Seimas and later a further protest was organised next to the cabinet building. On December 18, after negotiations with the striking teachers, the minister declared that agreement was reached on adjustments to the teachers' wage payment system. Audits were started in 17 subordinate institutions of the Ministry of Education and Science, internal resources were being sought for teachers' wages. A. Navickas also declared that the teachers will leave the ministry's premises on the next day and ending the strike would be considered in a few days.